Jobile pro is a lightweight, fast, clean and super flexible bootstrap based responsive theme for your job portal website. With this theme you can create your own careers / openings website for your business. Jobile pro theme can also be used to create classified ads, blog , business or personal websites also. Jobile pro has got theme options to manage general settings and also custom widget to manage social icons and text areas in the footer. Jobile Pro comes with Unlimited Color Options. You can choose any color which suits your branding. Jobile Pro is 100% mobile responsive so your website will look awesome and user friendly on PCs, Mac Books, Mobiles and Ipads. Jobile Pro comes with a few awesome Google Fonts as well. So now you can choose the best font as per your requirements. Jobile Pro is speed optimized. So you’ll get high priority in all search engine along with very swift user experience to the users when they visit your website as it’ll load with super fast speed. Jobile Pro comes with drag and drop home page builder. So you can change the order of any element of the home page using just drag and drop. You can even hide a particular element, if you want. 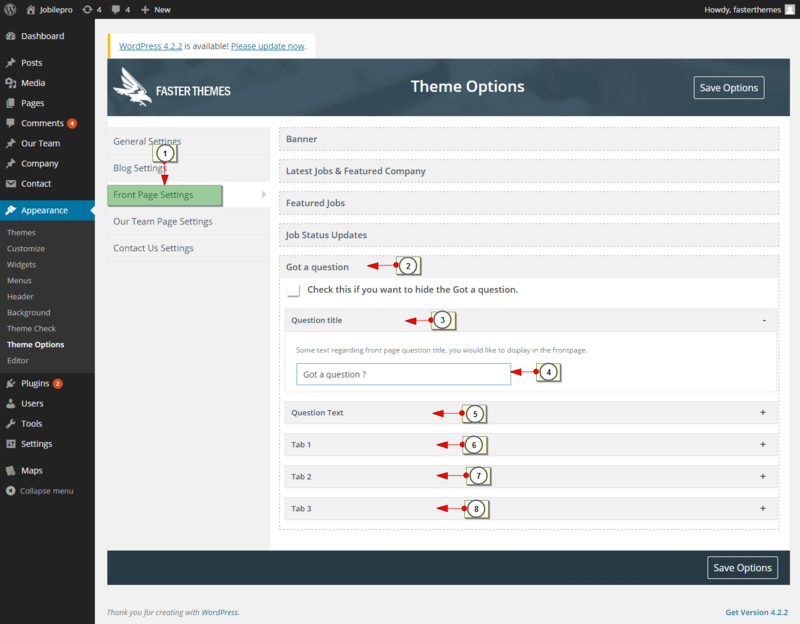 In Jobile Pro, you get options to choose the layout of your single post. So now it can have left sidebar, right sidebar or even without sidebar i.e. Full width. Jobile Pro is a WooCommerce ready theme. So you can start selling job posting slots or for that matter anything whatsoever you want ! Jobile Pro is SEO friendly. So you get better Google Rankings which will in turn help you in getting more FREE TRAFFIC ! 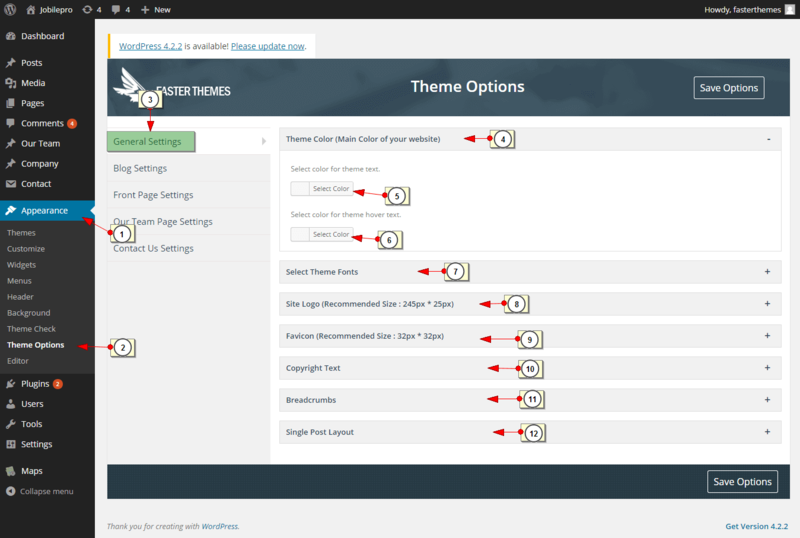 General settings of this theme allow users to change color scheme, Font style of the theme, Logo, Favicon, Copyright , Breadcrumbs Options and layout of the Single post type. 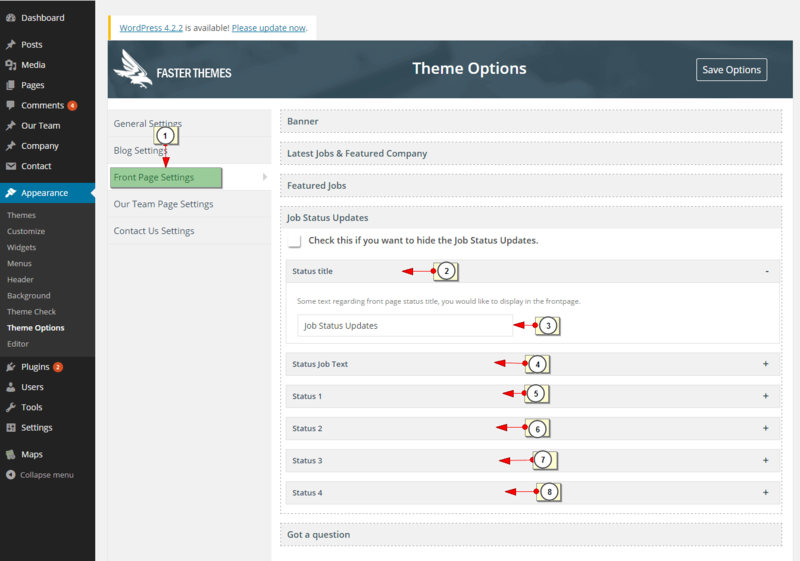 Joblie pro theme comes with re-arrangable areas (Banner, Latest Jobs & Featured Company, Featured Jobs, Job Status Updates and Got a question). All you have to do is simple drag and shift up or down as you like them to display on the Home page front end. Selecting Latest Jobs & Featured Company section for editing will allow you to edit latest job title and featured company title. which will be displayed on the home page. Selecting featured Job section for editing will allow you to edit featured job title. which will be displayed on the home page. Selecting Job Status Updates section for editing will allow you to edit Status title, Short description and other job fields. which will be displayed on the home page. Selecting Got a question section for editing will allow you to edit question title, Short description and other question fields. which will be displayed on the home page. 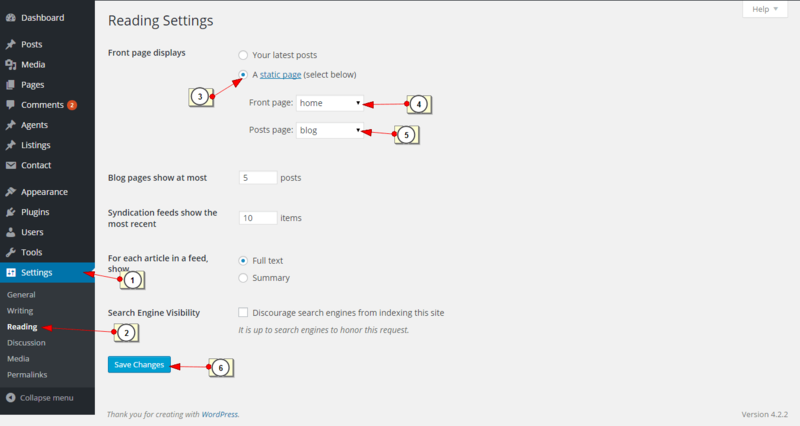 Step 1 : Create a home page by following the steps shown in the image below. Step 2 : After creating home page create blog page as well (if you need a blog). After home and blog pages are created, go to Settings > Reading, check the Radio button and follow the steps as shown in the image below. This section allows very easy change of team information which will be displayed on the team page on front end.